The remaining co-hosts of “CBS This Morning” opened Tuesday’s show with a full airing covering the multiple allegations of sexual misconduct by co-anchor Charlie Rose. After a lengthy segment addressing the charges and Rose’s long career, the show’s other co-anchors, Gayle King and Norah O’Donnell, both issued their own forceful rebukes of Rose — who was suspended Monday. “I’ve enjoyed a friendship and a partnership with Charlie for the past five years. I’ve held him in such high regard and I’m really struggling because what do you say when someone who you deeply care about has done something that is so horrible? How do you wrap your brain around that,” she added. On Monday, the Washington Post reported that eight women accused Rose of sexual misconduct, including accusations of groping and at least one instance of exposing himself. The cases, which spanned from the mid-1990s to 2011, all involved younger women who worked on his eponymous PBS program or aspired to do so. “The O’Reilly Factor” host Bill O’Reilly, the most-watched and most profitable personality on cable news, is officially out at Fox News. Here’s everything you need to know about the Fox profit machine’s fall from grace amid sexual harassment scandals. This year, O’Reilly has continued to dominate the ratings, ranking as the No. 1 most-watched cable news host — a position he’s held for more than a decade. Research firm Kantar Media estimated “The O’Reilly Factor” earned $446 million from advertisers between 2014 and 2016. See the 2017 cable rankings here. 2004: In O'Reilly's first public run-in with sexual harassment claims, the host settled a lawsuit filed by his former producer, Andrea Mackris, according to a Washington Post report. The payout in the settlement was not disclosed. January 2017: The current scandal begins to bubble when the New York Times reports that Fox News and O'Reilly secretly settled a sexual harassment lawsuit in January. Juliet Huddy, a former Fox News employee, alleged that in 2011, O'Reilly tried to derail her career after she turned down sexual advances he made on her. April 1, 2017: The New York Times reported that O’Reilly and Fox News have settled sexual harassment and verbal abuse claims with five different women aimed at the host over the years. The two settlements mentioned above had been previously reported, but three were unknown. The payouts to women to end their suits total $13 million. Read more here. April 1: In addition to the settlements, two other women allege sexual harassment against O’Reilly. Former Fox host Andrea Tantaros alleged O’Reilly sexually harassed her in a lawsuit against former Fox CEO Roger Ailes. Radio host Wendy Walsh also came forward to allege O’Reilly made sexual advances on her when she was a guest on his show in 2013, and reneged on a promise to get her a job at the network after she rebuffed him. April 4: As the scandal grew, O'Reilly sponsors began to jump ship. Eleven O'Reilly sponsors exit the show, including Mercedes-Benz, Hyundai, Mitsubishi, BMW, GlaxoSmithKline, Allstate, T. Rowe Price and Constant Contact. Read the full story here. April 5: Donald Trump supports O'Reilly, saying the host "shouldn't have settled." Trump also said "I don't think Bill did anything wrong." Read the rest of the story here. April 5: Even more sponsors pulled their support for "The O'Reilly Factor." The advertisers jumping ship include Lexus, Credit Karma, Bayer, TrueCar, Wayfair, Orkin, Society for Human Resources Management, CFP Board and Coldwell Banker. The total number of sponsors departing the show now totaled at least 20. Read more here. April 5: As the scandal heated up, others weighed in, including former Obama speechwriters. Celebrities such as Patton Oswalt and Bette Midler called for O'Reilly's firing on Twitter. D.L. Hughley wondered if O'Reilly has become a target because of his money, amid a few jokes at his expense. April 6: As more advertisers pulled out of "The O'Reilly Factor," two sponsors told TheWrap their ads were aired by Fox News against their wishes. Both MyPillow and Crowne Plaza said their ads were aired despite instructions to Fox not to do so. Read more here. April 7: Fox apparently stands behind O’Reilly despite sexual harassment allegations, and women at the network are reportedly “in anguish” that O’Reilly went “unrebuked.” Meanwhile, the number of advertisers who have pulled out from “The O’Reilly Factor” climbed to 60 or more. Read the full story here. April 7: Angie’s List, an advertiser that vocally stood by O’Reilly through the scandal, bowed to public boycott pressure and dropped its “Factor” sponsorship. Read the story here. April 8: "Saturday Night Live" took aim at the O'Reilly scandal, while sending up Trump's support for the host. Alec Baldwin played both O'Reilly and Trump on the show. Watch the sketch here. April 9: Fox News pledged to investigate the sexual harassment claims against O'Reilly, including Walsh's. Read the full story here. April 11: Fox News aired what might have been the final episode of “The O’Reilly Factor.” The April 11 episode is O’Reilly’s last before a vacation he said he scheduled in the fall, running until April 24. But reports suggested O’Reilly may not return to the network when his vacation ends. Read more here. April 13: In a letter congratulating Fox News on recent successes, Executive Chairman Rupert Murdoch failed to mention O’Reilly or the ongoing scandal. Read the full story here. 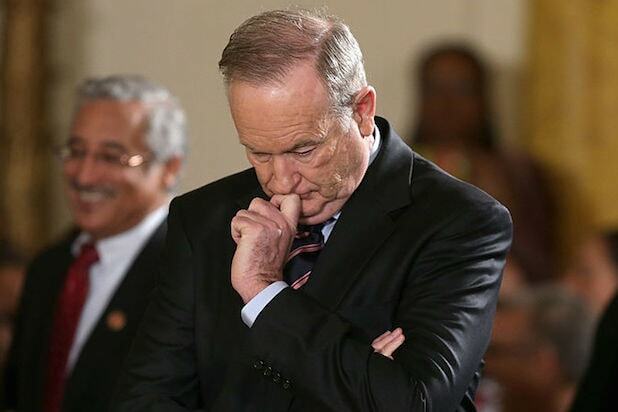 April 18: An African American woman came forward to allege O'Reilly sexually and racially harassed her as a protest advocating O'Reilly's firing takes place at the Fox News headquarters in New York City. According to a statement by lawyer Lisa Bloom, the woman is "not asking for money, just accountability." Read more here. April 18: The Wall Street Journal, a publication owned by the Murdoch family (who also own Fox news), reported the network was looking to cut ties with O'Reilly before he returned from his scheduled vacation on April 24. Read the full story here. April 19: Women’s advocacy group UltraViolet urges Fox to “stop protecting sexual harassers” and fire O’Reilly in an online ad. Read more here. April 19: Fox News parent company 20th Century Fox releases a statement that O'Reilly will not return to the network. Read the story here.